Rachel is a girly girl who loves dolls, books, arts and crafts, and everything pink. But she is "more than just a princess". She is athletic and creative and great with math and science. We will still get her the girly gifts that she loves this Christmas but I'm so excited to have found a new toy that is actually made to empower girls and encourage them to be interested in the way things work. Introducing Goldie Blox and the Spinning Machine ! Goldie Blox is an incredible new toy for girls developed by Debbie Sterling, an engineering graduate of Stanford University. She recognized the lack of women in the field of engineering. She realized that society often steers girls away from expanding their problem solving skills and instead just encourages them to play with Barbies, tiaras, and other girly things. The Toy and Game Inventor of the Year Awards were just announced last night and Debbie Sterling won the Rising Star award! Congratulations! 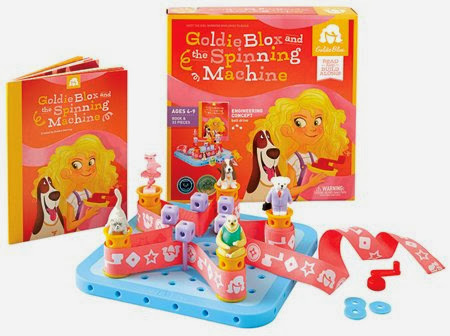 Goldie Blox and the Spinning Machine is the hot item on every girl's Christmas wish list this year. It is intended for ages 4-9 and costs $29.99.